Our deck builders can help repair your deck and fix your patio to ensure your outdoor living space will last a lifetime. Having a deck installation or new patio can be a wonderful addition to your home. Sunrise Roofing & Chimney provides the best deck repair and patio repair on Long Island. With over 15 years experience in deck repair, our expert deck contractors will fix your deck or patio from common problems. 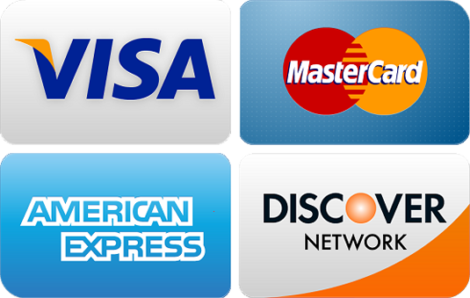 We work with all types of decks and we can diagnose your problem from the source. We’re forthright and honest when it comes to fixing your deck or patio. Owning a deck or patio can be alot of maintenance. Decks and patios are exposed to natural elements in the environment that can cause rotting. 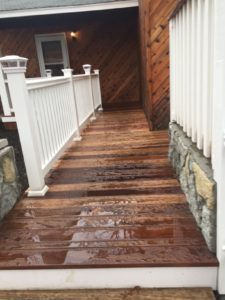 Natural elements such as snow, rain and heavy winds can damage your deck or patio over time. Sunrise Roofing & Chimney can help fix any problems you have with your deck or patio. When you schedule a free deck repair consultation, our expert deck specialists will come to your home and inspect the damage right away. We will give you an immediate evaluation and diagnose the problem. In some cases your deck may be beyond repair. If that is the case, we can help by constructing a brand new deck. Whether it’s an issue with a deck board, railing or foundation, Sunrise Roofing & Chimney can help! 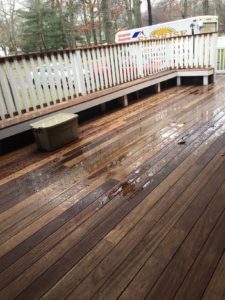 How Do You Know Your Deck Needs To Be Repaired? The most common problems that homeowners find with their decks are loose or rotting boards, railings, or foundation. Other common signs may include a crack in a board, railing, or the structure of your deck. If you suspect your deck needs to be repaired give Sunrise Roofing and Chimney a call today and receive your Free Deck Estimate. In order to maintain your deck, it is best to keep it clean. By removing snow, leaves, and dirt from your deck it will help the material of your deck stay as strong as possible. Additionally, washing your deck at least once per year can help prevent mold and mildew from forming which can help decrease the number of repairs needed for your deck. 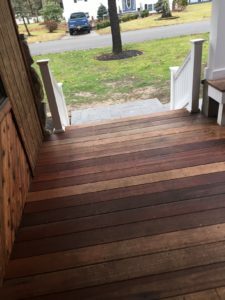 How much does it cost to repair a deck? Each deck repair project is different. The best way to keep your costs as low as possible is to call us when you first notice an issue with your deck. The longer that homeowners wait to repair a deck, the bigger the problem will become and the more expensive the repair will be. We provide deck repair services in Nassau and Suffolk County. To learn more about our deck repair services call us at (631) 657-5059.